The city of Trogir is located only a 40-min car ride away from the city of Split. Just like Split, Trogir can also be found on the UNESCO's world heritage list. Its exciting history, Romantic-Gothic building, typically relaxed Mediterranean atmosphere and kilometers long pebble beaches are the reasons why its so popular among tourists from all over the world. The island of Čiovo is located right next to Trogir, with only a bridge standing between the two. If you're planning on spending your summer holiday in Trogir or taking a one-day trip to Trogir and Čiovo to go swimming, do take a couple of minutes to read about the best beaches of Trogir and Čiovo. Considering the fact that Trogir and Čiovo are popular among families with children, our list of the best beaches in these two destinations is opened by the Pantana beach. 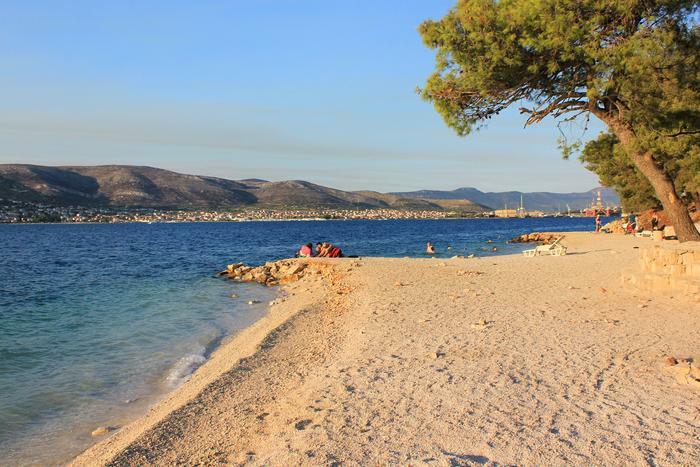 This pebbly-sand beach next to Trogir offers everything you need for a whole day of fun. It is almost half a kilometer long, surrounded by thick pine woods providing nice shade during hot summer months. There are a market and a restaurant nearby, and the beach itself provides quite a lot: a couple of beach bars, sunbeds and parasols for rent, beach volleyball or badminton courts, and paddle boat and kayak rides. The popular Medena beach is named after the three-star hotel located in the area. This is a three kilometers long pebble beach stretching from Seget to the Medena hotel. Those who enjoy sports and fun activities will love the beach, just like families with children do. You will find playgrounds, tennis, soccer and beach volleyball courts just like restaurants, supermarkets, gift shops... If you come by car, there's a parking lot where you can park your car for a fee, but there's also a taxi boat that can take you there from Trogir. Those who love fun and nightlife simply cannot miss the Okrug beach or Copacabana, as it is called because of its popularity and a big number of restaurants, bars and cafes that spread along this beach. The beach is located on the west side of the island of Čiovo and it is two kilometers long. Because of its fine pebbles, variety of fun activities and thick shade provided by the pine trees, it is ideal for families with children. You will find the Kava Slatine beach on the east side of the island of Čiovo. Unlike other beaches on this list, it is home to only one bar. That is why we recommend bringing something to drink and eat. This partly pebbly and partly rocky beach is special for its untouched nature since it's located on the uninhabited part of the island. But, despite its isolated location, it can get crowded during summer. Rent sunbeds and parasols or simply put your beach towel in the shade of pine trees. Where to stay in Trogir? Where to stay on the island of Čiovo?